Task shifting is the reallocation of clinical tasks to health workers with fewer qualifications, using shorter training periods. Task shifting approaches can extend existing health services, but innovative programs are required to teach the new skills. It is not known whether a focused training program can teach health workers the skills to perform accurate echocardiography. A pilot study demonstrated the feasibility of training two nurses,  and others have reported limited experience with training medical students. 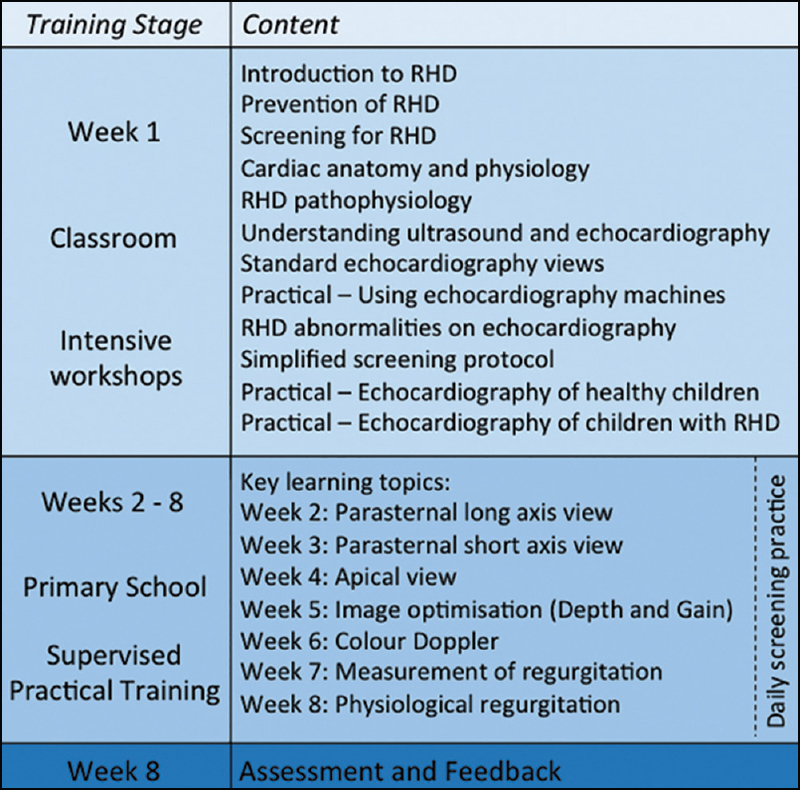 , We present here the training curriculum we developed for nonexpert health workers in basic echocardiography for RHD screening, initial results, and feedback. The study took place in Suva, Fiji, in the South Pacific. Fiji has among the highest burden of RHD globally. The training program consisted of 1 week of classroom-based workshops, followed by 7 weeks of supervised practical training [Figure 1]. The syllabus was enhanced from the pilot study,  including a longer period of supervised field experience and greater emphasis on the optimization of two-dimensional images. Seven nurses with child health experience participated; none had any prior exposure to echocardiography. The classroom-based workshops in the 1 st week of training taught relevant cardiac anatomy and physiology, as well as basic knowledge about RHD and the rationale for screening. 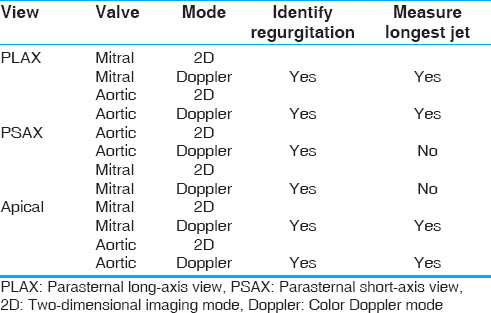 Teaching of pathophysiology focused on regurgitation and stenosis of the mitral and aortic valves. Nurses were introduced to the principles of ultrasound and echocardiographic views; and then taught a simplified 12-step protocol, limited to the left side of the heart [Table 1]. Practical sessions included the essentials of using the machines, and practice with volunteer children, including some with known RHD. A pediatric cardiologist and pediatrician facilitated the training. During the following 7 weeks, nurses attended weekly interactive tutorials that built on these concepts [Figure 1]. Each week was dedicated to a key learning topic including the three echocardiographic views, optimization of images, and measurement of regurgitation. Nurses were also taught about differential diagnoses for regurgitation, including physiological regurgitation and closing volumes. Nurses spent the remainder of the training period practicing skills with volunteer children in a school setting, supervised by an experienced pediatrician and/or technician. Each week, nurses submitted their 'Best Echo,' and training workbooks, demonstrating the learning objectives of that week. De-identified echocardiograms and workbooks were reviewed online by a pediatric cardiologist and pediatrician, who then provided individual feedback. Nurses were required to maintain a logbook of all training activities, and complete self-reflective learning exercises. Interactive, small-group workshops facilitated experiential learning. Anatomical posters, heart models, and an echocardiography image and video library reinforced visual learning and pattern recognition. Daily formative assessments enhanced knowledge acquisition and motivation, and personalized feedback was given frequently. The nurses used the Sonosite M-Turbo® portable ultrasound machine, which is relatively affordable and portable whilst maintaining adequate quality for assessment of regurgitation with color Doppler mode. The teaching program had access to two machines between the seven nurses. Participants reported their knowledge of cardiac anatomy, physiology, and features of RHD before and after the training. A knowledge score (maximum of 15) was calculated from the sum of knowledge questions. Participants also completed a questionnaire on the training components and design, such as length and difficulty of the program. Responses were grouped thematically and key quotes identified. The Fiji Human Research Ethics Review Committee approved the project. At the end-of-training skills assessment, 55 of 56 (98%) nurse echocardiograms were of adequate quality for diagnosis. Four children were diagnosed with definite or borderline RHD on the technician echocardiograms. All nurses identified all RHD cases, but also recorded regurgitation in several children without RHD, where physiological regurgitation or closing volumes were visible on color Doppler. Mean knowledge scores increased from 8.1 prior to training (range 5-15) to 14.9 (range 14-15) after training. On the feedback questionnaire, nurses described the classroom workshops as "interesting" and "easy to understand", and the screening protocol as "easy to follow" and "helps me remember which image to do first". Several nurses mentioned that during the practical weeks, supervisors were "very helpful" but "sometimes unavailable or too busy". Most comments were strongly positive, particularly for the "opportunity to learn new knowledge and skills". Two negative comments referred to the training being "very tiring" and the "wasted time waiting". Most nurses judged the length of training to be appropriate, although two recommended "as least 2 weeks for classroom theory," and conversely, another suggested to "shorten the training to 1 month". All nurses felt "well supported by colleagues and family", and therefore the time away from home "was worth it". At the completion of our program, nurses were able to perform screening echocardiography of adequate quality, despite no prior relevant experience. Feedback on the training methods was strongly positive, and knowledge appeared to have increased. Increased access to echocardiography machines and trainers may allow a shorter training duration, although resources are unlikely to permit this in most settings. Further, trainers observed that mastery of the new skills took considerable time and the 8-week program consolidated learning through repeat experiences. The results from our program are encouraging, but insufficient to draw conclusions about the effectiveness of training. We have commenced a follow-on study that will evaluate the accuracy of RHD screening by nonexpert operators using an adequately powered study design. Further refinements of training methods and screening protocols may lead to greater efficiency. For example, the parasternal short axis view may not be required. Screening models may need to be adapted to other regions, for example, in settings with low school enrolment. Developing a national population-screening program requires considerable further planning, including the scale-up of training and strategies to improve capacity in diagnosis and patient management. Training health workers without prior experience to perform basic echocardiography is feasible, and may facilitate RHD screening in settings with limited resources. The training syllabus presented here may be useful for other programs planning to train nonexpert operators in RHD screening. The authors would like to thank the participating nurses and children, as well as the Fiji Ministries of Health and Education for their close collaboration. We acknowledge the contribution of Jonathan Carapetis, Nigel Wilson, Laisiana Matatolu, Frances Matanatabu, Simione Rokosemudu, and Carol Fox. WHO Expert Consultation on Rheumatic Fever and Rheumatic Heart Disease. Rheumatic fever and rheumatic heart disease: Report of a WHO Expert Consultation, Geneva, 29 October - 1 November 2001. Geneva: WHO; 2004. Marijon E, Ou P, Celermajer DS, Ferreira B, Mocumbi AO, Jani D, et al. Prevalence of rheumatic heart disease detected by echocardiographic screening. N Engl J Med 2007;357:470-6. Ehler D, Carney DK, Dempsey AL, Rigling R, Kraft C, Witt SA, et al. Guidelines for cardiac sonographer education: Recommendations of the American Society of Echocardiography Sonographer Training and Education Committee. J Am Soc Echocardiogr 2001;14:77-84. Kumar RK. Delivering pediatric cardiac care with limited resources. Ann Pediatr Cardiol 2014;7:163-6. World Health Organization. Task Shifting: Rational redistribution of tasks amongst health workforce teams: Global recommendations and guidelines. Geneva: WHO; 2008. Global Health Workforce Alliance. Scaling up, saving lives: Task force for scaling up education and training for health workers. Geneva: WHO; 2008. Colquhoun SM, Carapetis JR, Kado JH, Reeves BM, Remenyi B, May W, et al. Pilot study of nurse-led rheumatic heart disease echocardiography screening in Fiji - A novel approach in a resource-poor setting. Cardiol Young 2013;23:546-52. Shmueli H, Burstein Y, Sagy I, Perry ZH, Ilia R, Henkin Y, et al. Briefly trained medical students can effectively identify rheumatic mitral valve injury using a hand-carried ultrasound. Echocardiography 2013;30:621-6. Barnes SS, Sim J, Marrone JR, Reddy VD, O'Carroll DC, Sumida L, et al. Echocardiographic screening of schoolchildren in American Samoa to detect rheumatic heart disease: A feasibility study. Pediatr Health Med Ther 2011;2:21. Colquhoun SM, Kado JH, Remenyi B, Wilson NJ, Carapetis JR, Steer AC. Echocardiographic screening in a resource poor setting: Borderline rheumatic heart disease could be a normal variant. Int J Cardiol 2014. Remenyi B, Wilson N, Steer A, Ferreira B, Kado J, Kumar K, et al. World Heart Federation criteria for echocardiographic diagnosis of rheumatic heart disease - an evidence-based guideline. Nat Rev Cardiol 2012;9:297-309.